There are things to love about winter, I think in the cold of winter to see some plants in flower gets you through a day of cold. I feel this every time I come in through the kitchen door and see the pot of flat leaf parsley in flower. The plants ran to flower after a lack of water in Autumn and are still looking good. I had friends staying on the weekend and like to put some flowers in the bed room they are using and on my way out to find something to put in a vase, the parsley cought my eye, I also wanted to see how they would last in water. The first day of the fair went very well, I did get a little cold standing outside all day but great to see all our supporters come and help us. It is moments like this that I really see how important Great Dixter is to a lot of people. I hope the weather is not too bad tomorrow and we have another day of good sales. We have cleared the halls, the tree is up. 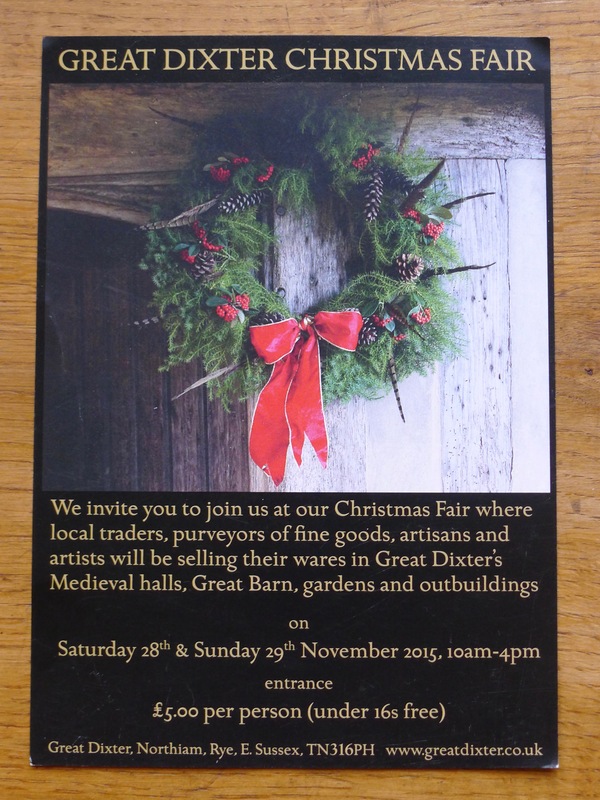 We have our annual Christmas Fair this weekend and so the whole place has to be great for it. The most important thing is the weather and we can not do a lot about that, just hope it is fine for more than 50% of the fair. 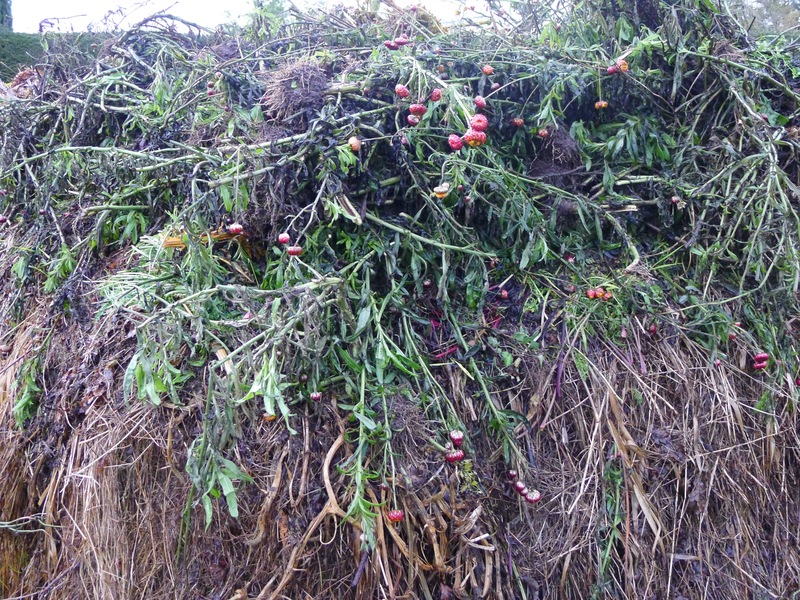 It was sad to see the Helichrysum on the compost heap but we have had a great crop from them and now the frost has killed them off. It is nice to know that they will be going back into the soil in three winters time with the winter digging. Matt has already sent us more seeds for next summer, and some different colours. I hope that he will be back in time to sow the seed for me in the spring. The area is looking very tidy now, I will dig the soil over next week. With this cold weather, a bowl of soup and toast is just perfect. Everything in the garden can be used at this tme of the year. The vegetable that the dogs and myself are really enjoying are the carrots, the one that has grown best for us and is still good is C.’Danvers’. I get the seed for this from the U.S, thank you Kyle. I will be growing this carrot again. Next time we have rain I am going to write my final seed order. Also the curley leaf parsley does very well in the soup, and perfect raw while out in the garden. It is good for the blood. It came on Saturday night and we have now had two nights of it, frost. The weather has turned a lot colder but with frost comes great clear days. I was happy to go up to the vegetable garden this morning and see the frost on the soil that I have dug, it is the whole point of winter digging. The artichokes looked very sorry for themselves but I am pleased to have the straw cover over their roots, I at least know it will not be so cold for them in the soil, after a few hours of sun on their leaves they did pick up again. Well it looks as if winter might have come and tomorrow night we may have our first frost. This of course means that any of the tender plants need to be under cover. Jonny started to get plants in for me yesterday, I had a study day to cook for. It was also a good day because Mrs Next-door was out and so she did not see the loads going into her summer house and glass house. The plant I really wanted to get under cover was the Dahlia campanulate that I got from my dear friend Ed Bowan, it is still in tight bud, I want to see what the flower is going to be like. It is now under glass.